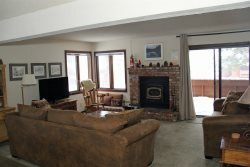 Standard Unit, 2 Bedroom & Loft & Three Bath Town home in the Scenic Meadow area of Mammoth Lakes. Sleeps up to 8 (approx. 1300 sq. Ft.). You enter the unit on the first floor which has both bedrooms and 2 full bathrooms, the second floor is the living room, kitchen, dining room and 3rd full bath and the third floor is the loft (open in to the living room by a half wall). New carpet and flooring installed throughout town home Sept. 2012. The master bedroom has a Tempur Pedic King bed; the second bedroom has a King bed, the loft has two twin beds and a queen bed and the living room has 1 queen sofa bed. 4 TVs, 1 HD Flat Screen TV in Living Room and Flat Screens in the Master Bedroom and Loft. 3 VCRs, DVD, stereo/cd, washer/dryer in unit. No Phone in unit. HIGH SPEED INTERNET - 50 MEGS. The Fireplace has recently been converted to a Pellet Stove. There are a maximum of two outdoor parking spaces available. Snowflower Features a Hot Spa and Sauna, Summer Time Only Swimming Pool, Tennis Court, and On-Site Laundry. There are no Buses, Motorhomes, Trailers or any type of Towed Vehicles allowed on the Snowflower property. COMPLIMENTARY INTERNET and CABLE TV are provided, however NO REFUNDS will be given for connectivity problems or Internet failure. PLEASE NO PETS. OWNER'S GRANDCHILDREN ARE VERY ALLERGIC. TOT LICENSE 807-SF53. We had a great time in Mammoth Lakes at SF53 and plan to return again next summer to unit 53 if possible. Hello! Yes we had a wonderful time! It was great having two king bed bedroom suites. It was perfect for two families each with a tall Dad(though my husband did not care for that tempurpedic mattress but I got used to it). What I loved most of all was how the condo was situated as the view was breathtaking. So nice to sit on that big L shaped couch and look out the window. The storage closet for the equipment was also great and that no-hassle pellet fireplace was so nice and easy! We also loved that the condo was close to everything we needed. Yes, we enjoyed our recent stay. The condo was well-appointed and in a convenient location. We especially appreciated that the condo had been very well cleaned before our arrival. Thank you are stay was great. Very nice place, enjoyed the stay. It is a great place at a great location.right next to the town loop trail.very quiet and cozy. We were 3 couples up for the weekend from LA. We had a great time. We had everything we needed. The house is rustic and a bit outdated but it is very comfortable. Great place to stay in Mammoth. Has plenty of room and is cozy. Everything was great. The condo is wonderful. We will see you next summer.